Two hulls mean that a special technique is needed to launch or retrieve a catamaran on its dolly. Once on the water, the catamaran provides the crew with an extremely stable platform as they prepare to leave the beach or come in from sailing. place, one crew lifts a bow while the other pushes the trolley underneath. The dolly supports should be pushed as far back as the balance point of the hulls, usually just behind the front beam. Oversize tires make it possible to wheel the boat on its dolly, even across soft sand or loose shingle. 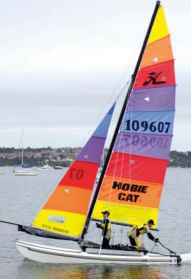 1A catamaran is rigid enough for the whole boat to be lifted by one bow. Raise the rudders, and protect the sterns from the ground—two old tires are suitable for this. 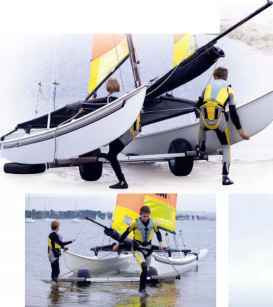 2 With sails uncleated, and the dolly under the balance point of the twin hulls, push the catamaran into the water until it is deep enough to float. Then remove the dolly. If the wind is sideshore or onshore, the crew can hop on and sail away. In an offshore wind they can "reverse" away from the beach, sitting on the bows with the sterns lifted. The leeward rudder must be locked down before the helmsman can power up the mainsail. If the rudder blade is partly lifted, there will be marked weather helm. Landing a catamaran is usually simple— if the sand is soft you can even sail up the beach. Control your speed as you come ashore, and watch for swimmers. Keep the rudders down to maintain control; if you do not lift them in time, they will knock up on impact with the ground. In more difficult situations, such as a strong onshore wind pushing waves on to the beach, it is good practice to drop the mainsail offshore, roll it on the trampoline, and sail in under jib alone. If approaching a slipway, stop the boat by turning head to wind as you reach the slip, but do not let it ground.